Scale & Carbon Block Dual Pack Set For H2O-PRO Countertop Bottleless Water Coolers by InternationalH2O.com is a 2 cartridge replacement setup. The filters are designed to be dropped in from the top of the cooler, making it the easiest replacement install process for cartridges. 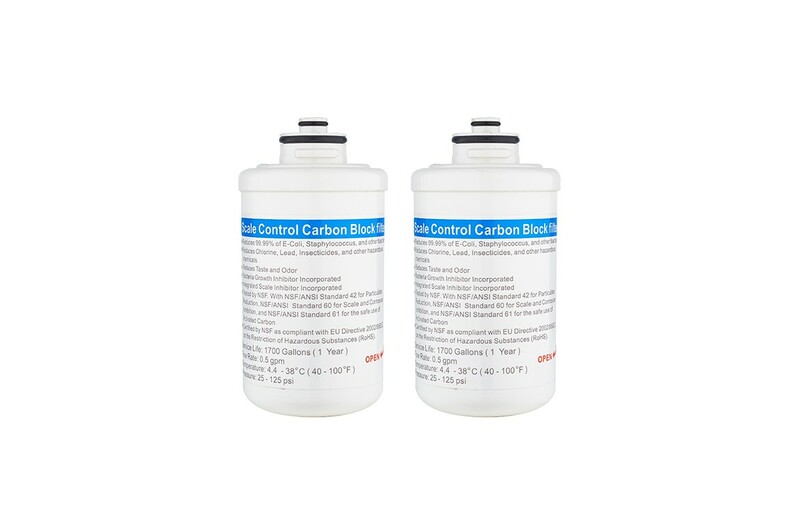 The set consists of 2 carbon-type filters. The filters use advanced technology to remove chlorine, lead, insecticides, reduce tastes and odors, prevent bacteria growth and also have a built-in Anti-Scale technology. Both filters are 1 micron Carbon Block Cartridges with Anti-Scale and bacteria reduction technology and proprietary blend of poly phosphate. Filters are tested by NSF with NSF/ANSI standard 42 for particulate reduction, NSF/ANSI standard 60 for scale and corrosion inhibition, and NSF/ANSI standard 61 for the safe use of activated carbon. Certified by NSF as compliant with EU Directive 2002/95ec on the restriction of hazardous substances (ROHS). Reduces 99.99% of e.Coli, Staphylococcus and other bacteria! Suggested: Replace filters every 6 months.